Help fit your customers in the right shoes and inserts that provide them with the most comfort. With a unique pressure profile, the SensorEdge Walk Right system can help you and your customers choose the insert or footwear best suited for them. Increase your sales and customer satisfaction by being able to provide recommendations based on a visual foot pressure profile of each individual. Track your WalkRight users by your own predefined criteria to measure and gather information for campaigns to identify target markets and increase sales. The customer enters personal information via touch screen computer. 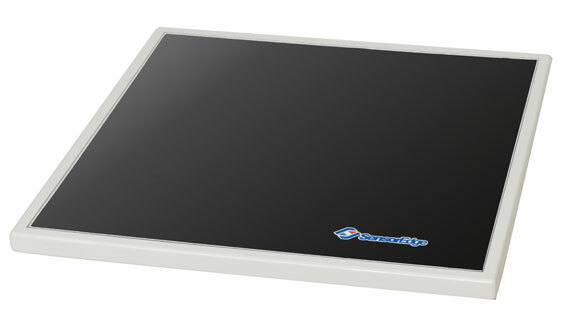 Then, he or she stands on the plate and their foot pressure profile is displayed on the screen. The customers pressure profile produces recommendations for footwear in your inventory. Use the customer information to send offers and reminders with an opt-in mailing system. 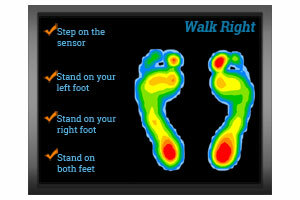 See instant visual output of the foot pressure profile when the customer steps on the plate. Store information and images for future review, analysis, or comparison. 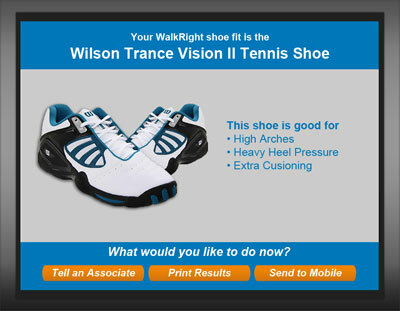 The foot pressure profile is used by the software to identify the right shoe in your inventory to sell to the customer. Print the foot pressure profile for the customer as a tool to help them see common problems. Email results, reminders and offers to the customers. Increase sales and provide personalized insight to your customer's cushioning needs. Interactive, unique customer experience which enables you to engage with the customer. Stand apart from your competitors with visual output of pressure points and weight distribution. Make accurate shoe fits with customized inventory lists and pressure maps. Provide individual customer service and identify target markets and trends with customer data.